McCall pattern 1221 for a smocked blouse. This image is from the Dec. 1946 catalog, but the pattern dates to 1945. After showing smocked dresses from the 1920’s for both women and children, I remembered that I have three vintage McCall Needlework catalogs. I found them, along with several used patterns, at an estate sale just down the block from my house. The woman who lived there had made this blouse pattern, McCall 1221, at least three times, in three different sizes. I like to think she made matching blouses for her daughters; perhaps she made one for herself, too. What a nice family photo that would have made. She had other used patterns for smocking, as well, so I’m guessing she enjoyed this craft, and was good at it. McCall smocking transfer 441 first appeared in 1936. 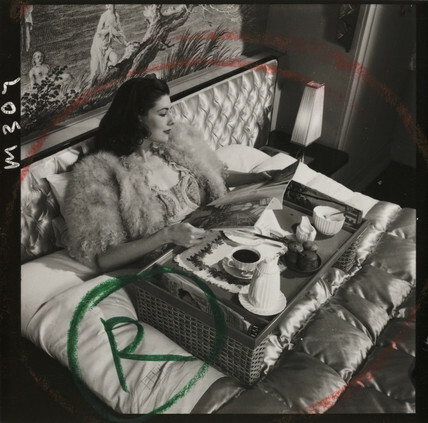 It was still in the Needlework Catalog in November of 1950, and probably later than that. This illustration gives you an idea of one basic smocking technique. It has many, many variations. McCall 441, description from the December 1946 Needlework Catalog. McCall smocking transfer 131 first appeared around 1934. It was in my catalogs for 1946 and 1950, too. Smocking was long a sign of quality (or of doting parents and grandparents) in children’s clothing. Click here for a child’s smocked dress from 1934. Click here for a child’s smocked Simplicity pattern from 1981. But there have been decades when smocking was also worn by grown women. The Commercial Pattern Archive at University of Rhode Island has McCall smocking transfer 1910, dated to 1931. It also has a smocked blouse pattern from Butterick, dated 1948. As a way of controlling and decorating gathers, smocking appears on several McCall patterns for women from the late 1940’s. McCall blouse pattern 1187 included an embroidery transfer for smocking (a grid-like pattern of dots) and smocking instructions. Image from Dec. 1946 catalog. McCall smocked blouse pattern 1136. Image from Deember 1946 catalog. Russia was allied with Britain and the U.S. in the defeat of Nazi Germany, and suffered terrible losses. In 1945, America was not yet in the grip of anti-communist hysteria, so Russian-style embroidery was admired. This smocked bed jacket appeared in 1944. This image is from the 1946 McCall needlework catalog, but it’s also in the catalog for November 1950, six years later. Description of McCall pattern 1133, Needlework Catalog for December 1946. Once people started watching TV in their bedrooms, you’d think bed jackets would have made a comeback. They’re not just for people who are served breakfast in bed. Once I started looking, I found about thirty smocking patterns — for the embroidery transfers or for clothing — just from those three McCall catalogs. I’ll concentrate on children’s patterns in other posts. 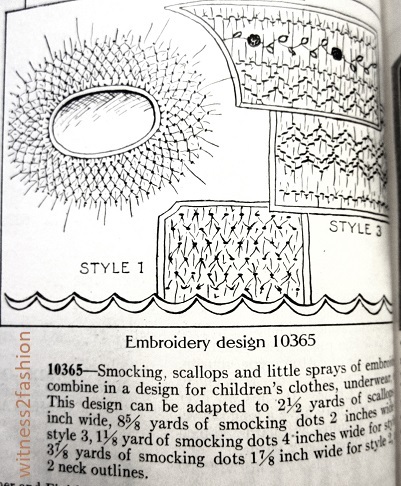 And I’ve requested a book about smocking from my local library: A-Z of Smocking edited by Sue Gardner, published in 2016. To get an idea of the range of designs that can be created using smocking techniques, visit this Pinterest page. Katafalk, a WordPress blogger, has a clearly illustrated demonstration of one kind of smocking. Click here.